Founder Gloria Simoneaux has recently been awarded a Fulbright Fellowship to lecture and research at the University of Nairobi, Kenya for a year. She will move to Kenya in September 2008. Harambee Arts training programs empower caregivers to feel more secure as they support and nurture the well-being of Africa's next generation of leaders. The trainings have been carefully honed so that they are accessible to a wide range of professional and semi-professionals and to the vast range of economic, cultural and age differences encountered. 1. 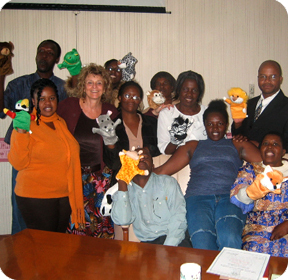 Provide training to caregivers in sub-Saharan Africa to facilitate expressive, nonverbal activities for vulnerable, traumatized children, including art, music, dance and movement to provide a non-threatening way for children to tell their stories, ground and organize their thoughts and feelings while communicating their experiences to others. 2. Teach caregivers to observe the children's nonverbal experience in order to help the children integrate the gains into counseling. 5. Empower children to transform their self-concept as an "HIV positive orphan" to a "productive member of the community." Several large international organizations, including Save the Children U.K. and Mercy Corps International, have also requested trainings for their local staff. Partner organizations are identified by referrals and through networking at international conferences and local academic institutions.